The term ‘opus anglicanum’ (English work) is used to describe English embroideries of the medieval period, and is often associated with particularly lavish work executed in silks and precious metals. Such embroideries were often made in professional workshops in London and were renowned throughout Europe at the time. Less well known is English work of a more modest type, of which this piece is an example. It is the only known piece of English medieval embroidery on which the maker's name is sewn. On the reverse, it states in Latin that Sister Joan of Beverly made it. The fact that it is signed suggests an amateur worker rather than professional. 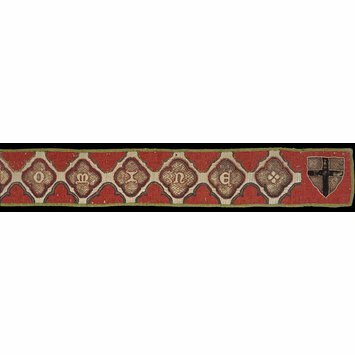 Superfrontal band for an altar with pattern of quatrefoils and inscriptions on front and signed at back. Worked in silver-gilt thread and coloured silks. A horizontal row of thirty two quatrefoils in gold contains the inscription: In hora mortis succurre nobis Domine'. Above and below are rows of half quatrefoils in red. At each end is a shield charged or a cross sable (Vesci?) and in the middle another or a lion rampant purpure (Lacy?). The ground of the band is worked with geometric diapers of stripes and small squares apparently in imitation of damask weaving. The quatrefoils are outlined in red and blue and the shields in white, the edge is worked in green. The inscription is in white knotted stitches. On the linen lining at the back there is another inscription worked in black thread (much obliterated and only decipherable via the holes where the stitches had been made). Donna Johanna Beverlai monaca me fecit. In Lombardic lettering, the first on the front, the second on the back. All embroidered rather than written. Given to the Museum by Monsieur G. Saville Seligman of 3 Avenue du Parc Monceau, Paris in 1923. It was reputed to have come from the collection of Lord Willoughby de Broke (sold as Lot 248 at Sotheby's sale, 28 January 1921). Originally recorded in Accession Register as 19th century embroidery in the style of the 14th century, but at time that sold at Christies in 1921 thought to be of this earlier date. In 1963, Donald King thought it dated to the late 13th or early 14th century and was merely a different category of English needlework from that which was then known. George Saville Seligman had also bought a stole (Lot 247, now T.343-1921) which the Museum coveted at this sale, and had promised to leave it to the Museum. Notes on this subject in the Registered papers indicate that the Museum had been prepared to purchase the stole from him at the price he paid, but had confidence in his promise that he would pass it on to them eventually as a gift, and he did so in November of the same year. (McKendrick, 28 February 1921 and 17 November 1921). This donor, in fact, gave various ecclesiastical items to the Museum between 1914 and 1923. (RP 1923/3729). In the Accession Register, Donald King noted in 1955 that in 1849, 1916 and 1921 the object was referred to as probably part of a funeral pall and dated to the 13th or 14th century. 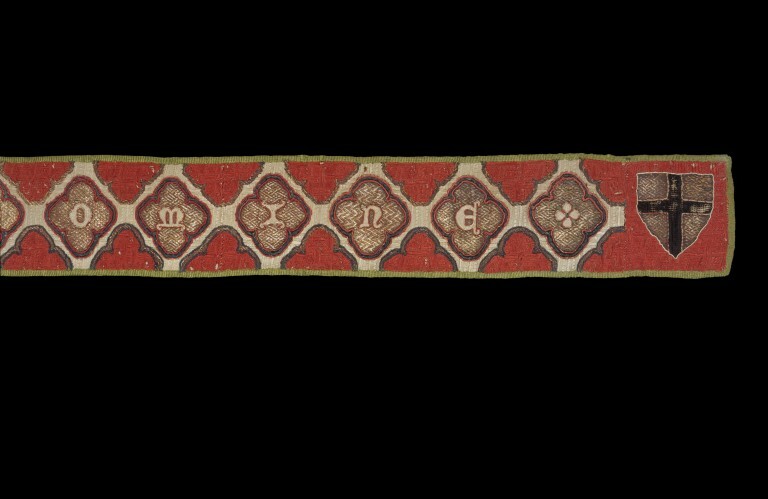 Historical significance: This is the only known signed piece of English medieval embroidery, signed by a nun, and in design and technique is quite unlike other surviving embroideries. The fact that it is signed (the maker embroidered her name on the back) suggests an amateur worker rather than professional. 'This embroidery by Johanna Beverlai, a nun, is the only signed English embroidery surviving from the Middle Ages. It is also of a unique type. The two facts are probably connected, for it is natural that the work of non-professional embroiderers should differ from that of professional workshops which constitutes the overwhelming majority of surviving embroideries. In the absence of comparative material the date of the piece is uncertain, but the green silk edging is very similar to that of seal bags of 1319 (cat. 206 ) and may well be of roughtly the same period.' These seal bags belong to the Corporation of London Records Office. Archaeological Journal, VI, 1849, p. 290. King, Donald. Opus anglicanum. London: HMSO, 1963, Cat. no. 43, p. 28. In Lombardic lettering, IN HORA MORTIS SUCCURRE NOBIS DOMINE. At either end, a shield of arms, Or a cross sable (Vesci), in the middle, a shield of arms, Or a lion rampant purpure (Lacy). Linen embroidered with silver-gilt thread, silk and fine cord; diagonal, tent, plait and stem stitches, detached twisted buttonhole stitch over padding, laid and couch work. The edges are bound with a needle-worked braid. On the back in Lombardi lettering, DOMNA JOHANNA BEVERLAI MONACA ME FECIT. Embroidered with black silk in double running stitches. This inscription suggests that the embroidery was worked by a non-professional embroideress. Ex Lord Willoughby de Broke Collections. Given by Monsieur G. Saville Seligman.